Before the discovery of the diffraction of X-rays in crystals some very important studies had been made of the quality of these rays by measuring their absorption in different materials. Especially Barkla had been able, by this rather simple method, to find some fundamental properties of the X-rays when they were scattered by different elements. It was known that the radiation leaving an X-ray tube was heterogeneous and dependent on the material of the anti-cathode. After passing a series of e.g. aluminum foils the 'softer' components of the radiation were successively reduced and finally the beam consisted of a rather homogeneous 'hard' radiation. The hardness of this radiation depends on the voltage applied to the X-ray tube. When such a homogeneous X-ray beam hits a plate of some element three kinds of secondary radiations are emitted. One part is scattered radiation with the same quality as the incoming one. The other two parts are characteristic of the element of the secondary radiator. One of them is an X-radiation, the other consists of negative particles, electrons. By systematic studies of this characteristic X-radiation from different elements in the periodic system Barkla distinguished two series of homogeneous X-radiation which he called the K- and the L-fluorescent radiations. Both these radiations become stepwise harder when the atomic weight of the 'radiator' increases. For the same element the emitted K-radiation is about 300 times as penetrating as the L-radiation. A condition for the appearance of these fluorescent radiations is that the incoming beam is somewhat harder than the characteristic radiation of the element in question. The emission of the electronic component of the secondary radiation was shown to be closely linked to the K- and L-series. Several important facts about the characteristic radiations were revealed empirically in these early researches on X-ray spectra, which formed the basis for the more quantitative and detailed studies made possible by using the diffraction of the X-radiation. As mentioned above, these earlier researches on characteristic X-radiation were carried out by using the fluorescence method with an ordinary X-ray tube as primary source. At this time the X-ray tubes, with cold cathode, mostly had an anti-cathode of platinum or platinized plates of copper, nickel, iron or silver. But in some cases experiments were also made with X-ray tubes of laboratory type having interchangeable anti-cathodes. The characteristic radiation sent out as 'primary' rays had a much higher intensity than could be obtained by secondary excitation. When the diffraction of X-rays was introduced for the analysis of the X-ray spectra the primary method remained for several years the usual method of producing the characteristic radiation from the different elements. The discovery of the diffraction of X-rays had solved the old controversy regarding the nature of these rays in favour of the hypothesis that they were electromagnetic waves. This meant that the X-ray spectra are of the same character as the optical spectra except that the wave-lengths are far shorter than even in the ultraviolet region of the optical spectroscopic field. We now know that the X-ray spectra have wave-lengths from hundred Ångström to tenths of an Ångström. In the first stages of the development of X-ray spectroscopy by means of diffraction in crystals, the radiation from ordinary technical X-ray tubes was registered. W. H. and W. L. Bragg (1913) used for the analysis a goniometer, where a rocksalt crystal was mounted on the rotating table. An ionization chamber on a turnable arm served for the registration of the 'reflected' X-ray beam. The distribution of the intensity as a function of the angle of incidence then showed, in two or three orders, three rather broad peaks on a background of the 'white' X-ray spectrum; these corresponded to the L-series of platinum which constituted the anti-cathode. In France, Maurice de Broglie in the same year (1913) registered on a fixed photographic plate the X-radiation reflected by a rotating crystal. In this way X-ray spectra with sharp and well defined lines of the same general appearance as those of optical spectra were obtained. 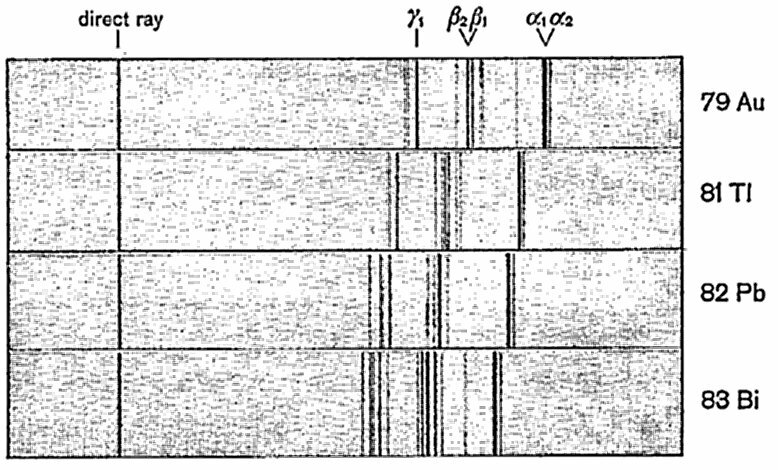 Besides the emission lines formed by the characteristic radiation of the anti-cathode, these spectral plates also showed two sharp discontinuities at fixed wave-lengths which seemed independent of the tension on the X-ray tube. The interpretation of these sudden changes of the blackening in the plates was easy to give on the basis of Barkla's earlier researches, which had shown that the excitations of the K- and L-series are connected with a strong increase in the absorption of the incoming rays. The two discontinuities in the blackening observed by de Broglie on his spectral plates were due to the K-absorption of Ag and Br in the photographic emulsion. These very first studies of the characteristic X-radiation by means of crystals showed that the K-and L-series each consisted of several well defined spectral lines placed close together, with a very wide gap between the wave-lengths of the two groups. As just mentioned the 'absorption spectra' appeared on the spectral plates as sharp, well defined 'absorption edges' connected with the K- and L-groups: a single edge for the K- and three edges for the L-series. It may be considered a fortunate accident that the new X-ray spectroscopic technique was ready for application at a time when the foundations for the understanding of atomic structure were just in their first state of development. Two years earlier Rutherford had presented good evidence for the hypothesis that the atoms are constituted of a minute positively charged nucleus, less than 10-12 cm in size, surrounded by a cluster of negative electrons with a total charge equal to the positive charge of the nucleus. Bohr (1913) was the first to apply the quantum theory of Planck to this atomic model and to give a quantitative theory for the simplest of all optical spectra, that of hydrogen, where just one electron is moving around the singly charged nucleus, the proton, in an orbit with dimensions of the order 10-8 cm. 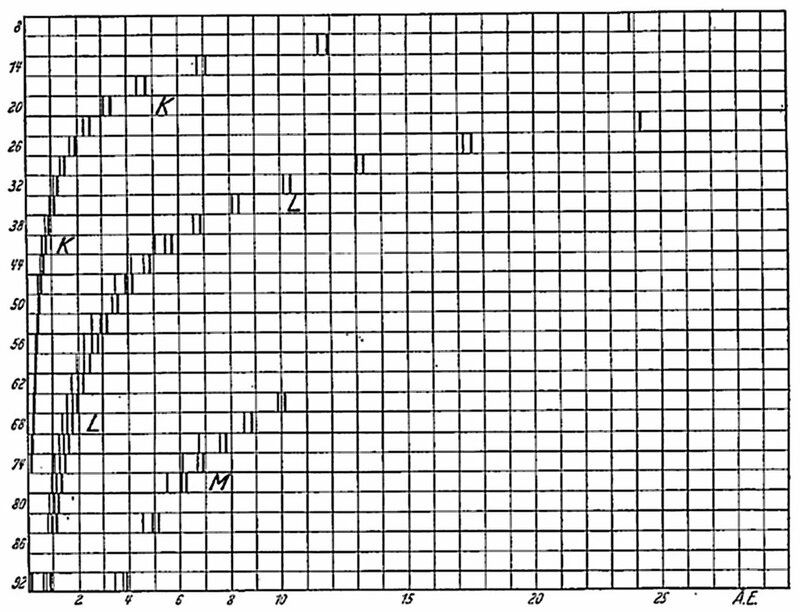 In a first systematic study of the K-spectra from the consecutive elements 19 Ca to 29 Zn H. G. J. Moseley in 19 13 was able to show that the square root of the frequencies of the K-lines progressed linearly with the atomic number in good agreement with formulas which could be derived from the quantum theory of radiation. In a second paper he measured several lines belonging to the L-series of the elements 40 Zr to 79 Au where the same regularities were found. This result, which is called the 'Moseley law', has been of fundamental importance for the further development of atomic theory. Through it the atomic number Z, which had been earlier introduced in the periodic system of the elements only as an ordinal number, obtained the physical significance of measuring the nuclear charge. One of the consequences was e.g. that X-ray spectra of unknown elements could be interpolated with full certainty and the existence of such elements could be established by registering their X-ray lines. The first successful application of this kind proved the existence of the missing element number 72 (Hafnium) which was found in a Zirconium mineral by D. Coster and G. v. Hevesy in 1923. 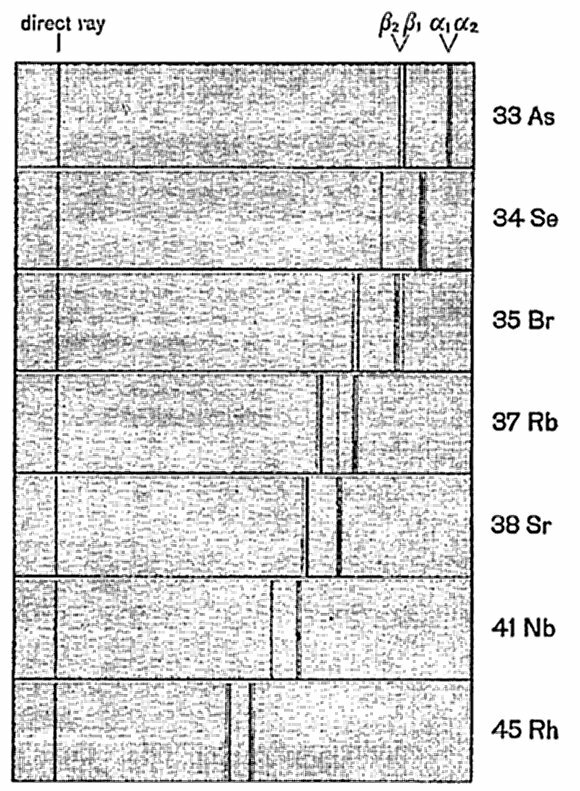 Later W. Noddack, I. Tacke and O. Berg found X-ray lines belonging to the missing element 75 (Rhenium) in the spectrum from the mineral columbite. These brilliant first results of crystal X-ray spectroscopy confirmed and extended the knowledge of the characteristic X-radiation. They showed that X-ray spectra were a complement to the optical spectra. A condition for further advance was an increase in the precision of the measurements of the wave-lengths both of the emission lines and the absorption discontinuities. This required an increase also of the resolution in the registered spectra. Only by complete and exact measurements of the X-ray spectra could a reliable picture be obtained of the atomic structure, as far as it influences this radiation. Even if it was soon shown that X-ray spectra were somewhat more complicated than the first studies seemed to indicate, they were ever so much simpler and less confusing than the optical spectra which often contain many thousands of spectral lines for a single element. As one of the first results with the new methods for registering X-ray spectra with increased resolution, it was found that the strongest line in the K-series, designed by Moseley Kα, was a narrow doublet, and that the fainter line Kβ had a still fainter line on its short wave-length side. The number of lines in the L-spectrum was soon found to be considerably higher than the first registrations had shown. All methods for determining X-ray wave-lengths using crystals as gratings are based on the Bragg law nλ = 2d sin θ and therefore λ is obtained by measuring the angle θ between the reflected beam (in the nth order) and the lattice surface. The value of the lattice constant d had been deduced for several crystals by the Braggs. The accuracy of this value was not very high; but as long as the same crystal is used for the registration, the relative values of the measured wave-lengths are not influenced by this uncertainty. By measuring the angle of reflection with high accuracy using a double angle method it was possible to increase the precision about a hundred-fold compared with earlier measurements. This of course was important for the numerical testing of the relations between different spectral lines which formed a check on systematics of the atomic structure. The domain of the X-ray spectra which can be registered using crystals as gratings extends from 20 Å to 0.1 Å, that is over nearly eight octaves; this may be compared to the range of the visible part of the spectrum which is just about one octave. Voltages corresponding to these X-ray wave-lengths are 600 to 130 000 Volt. The great differences in absorption in this wide region make it necessary to use special spectrometers as well as X-ray tubes and other equipment for each part of the X-ray range. For the greatest part the absorption of the X-radiation in air makes it necessary to use vacuum spectrometers. After these instrumental problems had been solved a rather complete and exact study of all X-ray emission spectra from 11 Na up to 92 U was carried through. Fig. 16-4(1). The K-series of the elements arsenic to rhodium. Fig. 16-4(2). The L-series of the elements gold to bismuth. Fig. 16-4(3). The strongest lines of the K-, L-, and M-series of every third element from 8 (oxygen) to 92 (uranium); wave-length region 0.1-25 Å. Abscissa: wave-lengths; ordinate: atomic numbers. A picture of the K-spectra of seven elements in the region 33 As to 45 Rh is shown in Fig. 16-4(1) and a similar picture of the L-series of the four elements 79 Au, 81 Tl, 82 Pb and 83 Bi is given in Fig. 16-4(2). 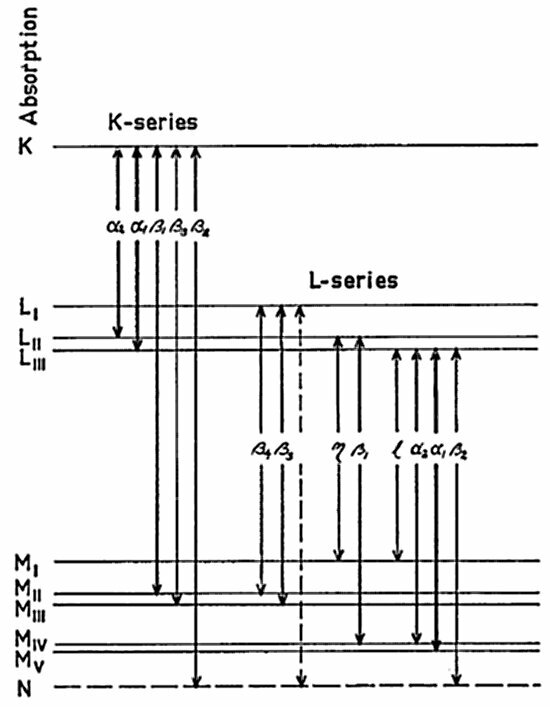 A schematic picture of the main lines in the K- and L-series as well as a part of the later discovered M-series is shown in Fig. 164(3) covering elements from 8 O to 92 U and the wave length region up to 25 Å. As already mentioned, characteristic absorption appears as 'absorption edges' in the recordings of X-ray spectra. For the K-series a single absorption edge at a wave-length very nearly equal to that of the shortest emission line was observed. In the region of the L-series three, and in the M-series five edges were found. As with the emission lines the square root of the frequencies of the absorption edges shows a linear relation to the atomic number of the elements as expressed by the Moseley law. The very simple structure of the emission and absorption spectra which is nearly unchanged from element to element, apart from a stepwise displacement to shorter wave-lengths with increasing atomic number, facilitated the interpretation of these spectra. Kossel, one of the many prominent members of the Sommerfeld school in Munich shortly after the time when Laue joined the group, suggested the following processes for the X-ray emission: The first step is the excitation of the atom whereby one of its inner electrons is thrown out by absorption of energy provided either by electrons from the cathode of the X-ray tube or by primary X-radiation. When the gap in the electronic configuration is then refilled by one of the outer electrons an X-ray line characteristic of the atom in question is emitted. This general picture then directly connects the K-, L-, M-, etc. series with electron groups in the atoms called electron shells. The refilling of a free electron place in the K-shell gives rise to the K-series whose different spectral lines are due to transitions of electrons from the L-, M- etc. shells, respectively. Similar emission processes occur at the refilling of free places in the L-, M-, etc. electron shells, respectively. With the exact and complete measurements of the X-ray emission and absorption spectra it was then possible to draw a level diagram connecting the different emission lines with the corresponding absorption limits, as is shown in Fig. 16-5(1) for30 Zn. For heavier elements these diagrams extend to higher levels N, O, P whereas for the lighter elements the outer levels successively vanish. Fig. 16-5(1). Energy levels, absorption and emission lines for element 30 (zinc). As is seen from the level diagram not all of the possible transitions between the levels are represented by spectral lines, e.g. the transition KLI, KMI, LIMI etc are not found. These missing lines were eagerly looked for in the earlier studies of the X-ray spectra. As a result of not finding them, 'selection' rules for existing transitions were formulated. The quantum theory of the atom, as it advanced through its stages of development, imbedded the empirically found selection rules. in its system of general principles. It is outside this article here to describe these theories. It may be added that these level diagrams include what may be called the normal spectral lines. But in different regions of elements several lines were observed and called 'satellites' which do not fit in with these 'normal' diagrams. These satellites are found e.g. in the K-series of the lightest elements in the vicinity of the Kα1, α2 lines, also near to the Lα of the middle elements and near the M-lines of the heaviest elements. In some cases these lines may be due to transitions in which two electrons are involved. Commonly the X-ray spectra have been studied when emitted from atoms in solids. In general these spectra are independent of the chemical binding and of the crystal lattice, because the transitions of the electrons occur in the shells which are mainly influenced by the field of the nucleus and of the electrons in the inner shells of the emitting atom. If the outermost shells or the valence electrons are involved in the emission or absorption process it is to be expected that the neighbouring atoms should influence the X-ray spectra. This was found to be the case as soon as the resolution and precision in the study of the X-ray spectra had been sufficiently developed. These effects were first found in the K-absorption spectra of Cl, S, P, Si and later in some cases up to Fe and to still heavier elements. In general these effects give rise to a complicated structure in the region of the absorption edge. Similar influences were also found in several emission spectra as a displacement of lines when the outermost shells were involved in the transition. Again in this case the K-series lines of the lighter elements were first studied. The displacement of e.g. the Kα doublet of 16 S is of the same magnitude as the wave-length difference between the two α-lines. As mentioned, these effects are due to the chemical state of the emitting atom or to the crystal lattice environment to which it is bonded. Inversely it is possible from the spectrogram in such cases to draw some conclusions about the atomic bonding state of the emitting substance if this is unknown. The Rutherford conception of the atom as consisting of a positively charged minute nucleus surrounded by a cluster of electrons was given a most convincing support by the study of the X-ray spectra. At the same time the collected results of these studies led to a picture of the way in which the electrons in the atoms were distributed. It was shown that if electrons are successively added to a nucleus of increasing charge from a few electrons for light atoms up to the 92th electron of uranium, they will arrange themselves in shells. In conformity with the designation of the spectral groups in the X-ray spectra these shells are called the K-, L-, M-, etc. shells. In the two first elements 1 H, 2 He only the K-shell is populated with electrons: one respectively two. In the next elements 3 Li to 10 Ne the L-shell is built up by adding successively 1 to 8 electrons in this shell. The final number of electrons in the M-shells is 18, in the N-shells 32. Uranium has 18 electrons in its O-shell and the rest (14) of the outer of its 92 electrons divided between the P- and Q-levels. For a more detailed picture it is necessary to consider, as suggested by S. Goudsmit and G. E. Uhlenbeck, the spin of the electron, and the Pauli Exclusion Principle which says that a certain electronic state, defined by its orbital quantum numbers, cannot be populated by more than two electrons. These two electrons then have their spins in opposite directions. Already in the very first stages of X-ray spectroscopy the possibility of using these methods for the purpose of chemical analysis was tried out. The discovery of two new elements, mentioned above, was among the first results. Even though it was soon shown that a very high sensitivity of the analysis could be obtained over a wide range of elements, the method found only a rather limited application for several years. The reason of this was that at that time, in order to obtain sufficient intensity of the spectra, the sample had to be introduced as a target into the tube. This required elaborate vacuum equipment and was otherwise inconvenient. The subsequent construction of technical X-ray tubes of high power, and the development of new, much more sensitive detectors for X-radiation, like Geiger, proportional, and scintillation counters, made it possible to use the fluorescence method of excitation for the analysis. What is then needed for X-ray spectroscopic analysis is electrical equipment for the running of the X-ray tube, and a crystal spectrometer with a suitable detector. The specimen is placed as close to the exit window of the tube as possible. The window may be made of light material, e.g. lithium glass or beryllium foil, so as to allow also the softer X-rays to come out. The spectrum of the secondary X-radiation emitted by the specimen is generally registered on a recorder. Suitable equipment has now been highly developed and is commercially available using both flat and bent analysing crystals with detectors suited for the different wave-length regions. The X-ray analytical method with a modern spectrographic outfit allows a more rapid analysis than the wet chemical methods. It is applicable for all elements from 22 Titanium to 92 Uranium and if specimen and spectrometer are placed in an air tight chamber under a pressure of 1 mm Hg also the elements down to 11 Sodium can be analysed. The sensitivity is such that many elements in as low a percentage as 0.001 may be found. In special cases also the absorption spectra have been used for analytical purposes. The X-ray analytical methods are non-destructive. They are nowadays very widely applied in such fields as metallurgy, geology, mineralogy, ceramics and for a great number of chemical problems. A most interesting application first suggested and developed by Castaing in a doctor thesis (1951) is the scanning microanalyzer. In this instrument the electron beam is focussed by two magnetic lenses to an exceedingly small area, about 1μ2, of the specimen. The primary X-radiation sent out from this point enters an X-ray spectrometer, which then shows what elements are present in this small area. Alternatively the secondary electrons may be registered. The instrument, which is evacuated, has a built-in optical microscope to observe what part of the specimen surface is hit by the electron impact. It is also possible to move the specimen for scanning the surface. Another device for this purpose is to let the electron beam sweep over a small area say 0.5 × 0.5 mm. The scanning microanalyzer has already found wide and important applications, especially for detailed study of the microcrystalline structure of metals, alloys, minerals and other solids. As may be seen from this short review of the development of X-ray spectroscopy it was early recognized that X-rays are emitted by the electron cloud surrounding the atomic nucleus. This opened the main way to explore the structure of the atom outside the nucleus. The shell structure of the atoms was not only confirmed in general but a detailed quantitative scheme of the energy levels could be gained. Taken together with the information about the outer energy levels as secured by the optical spectra, this provided the present detailed picture of the atom outside the nucleus. But even in the study of the nucleus, now in rapid progress, the knowledge of the energy levels of the electron shells plays an important role. The 'Auger electrons' as well as the Compton effect, which are intimately connected with the study of the phenomena of the nuclear radiation, were both discovered in the course of investigations of the X-ray spectra.